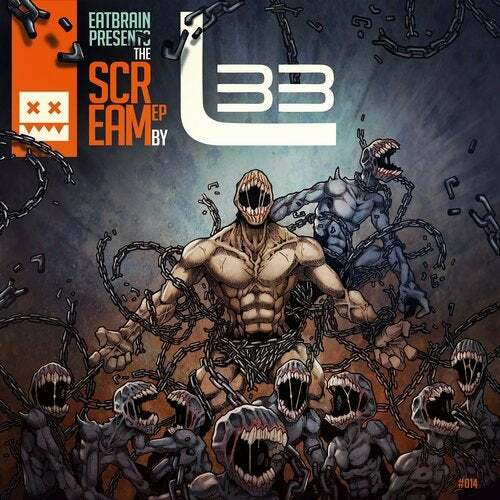 Neurofunk powerhouse label Eatbrain returns with its latest high quality offering, this time from the one known as L 33. The Bulgarian producer's futuristic, dancefloor-crushing sound has seen him rise to prominence over the last few years, with releases on a who's-who of neurofunk D&B labels. Now, he joins the Eatbrain fold with SCREAM EP - a fearsome 4 track offering of alien rhythms and sound design worthy of the most frenzied dancefloors. L 33 leads off with the intricate 'Scream'. Setting the stage with a haunting synth pattern underlying arrays of distant percussion, L 33 punctuates the atmosphere with sharp, grinding stabs before dispensing a pleasingly disjointed groove of weighty bass notes and carefully placed medleys. Next up, 'Digital Sound' wastes no time raising the pressure, building up before initiating a rolling, robotic funk complemented by a textured, distorted low end. L 33 ingrains his sinister melodic palate on the high-octane 'Oscillation', while 'Calibrate' primes listeners with an eerie cascade of dissonant arpeggios before initiating an aggressive dancefloor rhythm to close out the release. All in all, the SCREAM EP makes for a highly potent Eatbrain solo debut from the young Bulgarian talent - no doubt one of neurofunk drum & bass's rising stars. Expect no less from Eatbrain - purveyor of premier neurofunk drum & bass.